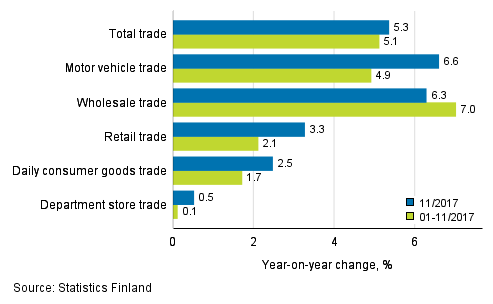 According to Statistics Finland, sales in total trade increased by 5.3 per cent in November from November 2016. Among trade industries, motor vehicle trade and wholesale trade grew most. Sales in motor vehicle trade increased by 6.6 per cent and in wholesale trade by 6.3 per cent year-on-year. Sales in retail trade increased by 3.3 per cent in November from one year ago. Among retail trade industries, sales of daily consumer goods grew by 2.5 per cent and sales in department store trade by 0.5 per cent from November 2016. The sales volume in retail trade was 3.4 per cent higher in November than twelve months earlier. Over the same period, the sales volume in wholesale trade grew by 1,8 per cent and in motor vehicle trade by 6.4 per cent from one year ago. The sales volume of total trade increased by 2.7 per cent in November from November 2016. In the January to November period, sales went up by 2.1 per cent in retail trade and by 7.0 per cent in wholesale trade compared with the corresponding period of 2016. Sales in motor vehicle trade increased by 4.9 per cent over the same period. Total trade sales increased by 5.1 per cent from January to November 2016. Turnover of trade will adopt base year 2015=100 from the January 2018 data. Data using the new base year will be published for the first time on 13 March 2018. ISSN=1799-0939. November 2017. Helsinki: Statistics Finland [referred: 23.4.2019].